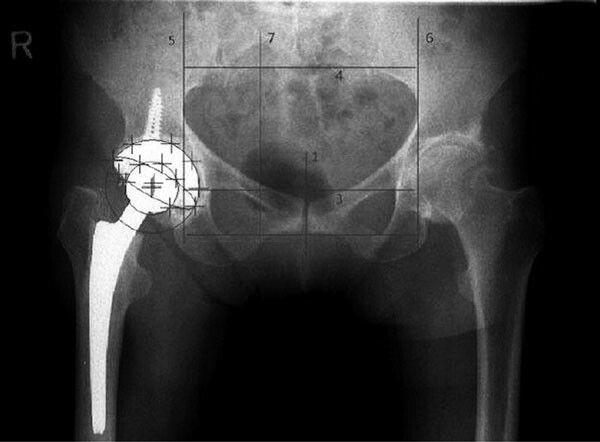 The aim of this study was to evaluate the initial acetabular implant stability and late acetabular implant migration in press fit cups combined with screw fixation of the acetabular component in order to answer the question whether screws are necessary for the fixation of the acetabular component in cementless primary total hip arthroplasty. One hundred and seven hips were available for follow-up after primary THA using a cementless, porous-coated acetabular component. A total of 631 standardized radiographs were analyzed digitally by the "single-film-x-ray-analysis" method (EBRA). One hundred 'and one (94.4%) acetabular components did not show significant migration of more than 1 mm. Six (5.6%) implants showed migration of more than 1 mm. Statistical analysis did not reveal preoperative patterns that would identify predictors for future migration. Our findings suggest that the use of screw fixation for cementless porous- coated acetabular components for primary THA does not prevent cup migration. The acetabular implant design and materials in cementless total hip arthroplasty (THA) have improved markedly over the past decades. Reduced roughness or improved polishing of the internal surface of the cup. Optimized conformity of the liner with the metal shell of the acetabular component, improved congruity of the screw heads in the acetabular shell, better liner locking mechanisms and other factors such as modification of the outer surface to promote bone ingrowth lead to an increase of the survivorship of cementless acetabular components with and without screw fixation [1–6]. Some data suggest that additional screw fixation in press-fit implants may support the initial stability and osseointegration and also prevent late migration of the acetabular component [1, 3, 7–10]. Evaluation of clinical (reoperations, outcome data) and radiographic parameters (osteolysis, bone loss, radiolucency, radiodensity) associated with cementless porous-coated acetabular component design and poly-ethylene that is sterilized in an inert environment and stored in a vacuum provided by barrier packaging should allow a more equitable study of acetabular fixation than was possible in the past. 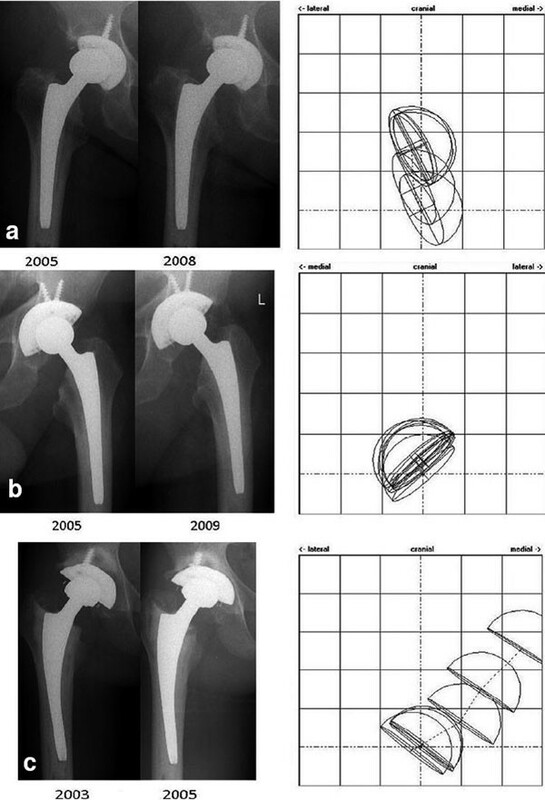 The aim of this study was to evaluate initial acetabular implant stability and late acetabular implant migration of press fit cups with additional screw fixation of the acetabular component in order to answer the question whether screws are necessary for the fixation of the acetabular component in cementless primary THA. A total of 631 standardized radiographs were analyzed using the "single-film-x-ray-analysis" digital method (Einzel-Bild-Röntgen-Analyse, EBRA, Institute of Geometry, University of Insbruck, Austria). This method has been validated and employed in several clinical trials during the past years [15–22]. We retrospectively analyzed the data regarding 107 cementless hemispheric porous-coated acetabular components (103 primary total hip operations, 4 revision surgeries) implanted in 102 patients (66 female, 36 male patients, average age: 63.4 ± 15.8 years), with at least 6 months of follow-up. A total of 631 standardized radiographs were analyzed by the "single-film-x- ray-analysis" digital method (EBRA, i.e. Einzel Bild Roentgen Analyse)). Average follow-up was 2.6 ± 1.7 years after surgery. Exclusion criteria included absence of at least 4 standing a.p. pelvic x-rays during routine clinical and radiographic follow-up and revision total hip operations. The reason for 103 primary total hip arthroplasty (THA) was primary osteoarthritis, posttraumatic arthritis or dysplasia osteoarthritis in 84 (81.5%) cases, femoral head necrosis in 16 (15.5%) cases, and femoral neck fracture in 3 (2.9%) cases. four revision THA's were performed due to aseptic cup loosening 9.2 ± 4.9 years (range 1.8-12.0 years after primary total hip operation. Two different porous-coated acetabular components (Duraloc, n = 33, Alpha Lock Plus, n = 74) were evaluated in this study. The Duraloc cup (DePuy Orthopedics, Johnson & Johnson, Warsaw, USA) is a modular, second-generation porous-coated socket with a ring locking mechanism. The Duraloc cups used in this series were the Duraloc sector (3 holes) and the Duraloc 1200 series (a multihole component). The Alpha Lock Plus (Corin Group PLC, Cirencester, UK) cup is a porous-coated cup with a pore size of 50 to 100 μm and an additional coating of calcium-phosphate. The cup has 5 holes that can be used to place a screw or filled with a hole eliminator. The threaded insertion hole at the apex of the hemisphere can also be filled with a central hole eliminator. The cup inlay was a standard 0° polyethylene inlay (XLPE of DePuy Orthopedics or UHMWPE of Corin). Eighty-six percent of all operations were performed by two of us (RK., MJ.) between 2001 and 2007 using a standarized Bauer/Hardinge lateral approach. Radiographic evaluation included a standing anterior/posterior radiograph of the pelvis centred on the pubic symphysis with inclusion of the proximal part of the femur and distal to the tip of the femoral stem. Postoperative gaps, radiolucent lines, bone loss, osteolytic lesions and radiodensities were identified and followed on sequential radiographs to detect progressive lesions noted in the 3 acetabular zones of DeLee and Charnley . EBRA-analysis was performed by one independent observer (SD.) according to the software designer's instructions: a series of at least 4 comparable pelvic films is necessary for the analysis. By use of a corresponding comparability algorithm, unsuitable projections are excluded from the analysis. The comparability limit required for the requested accuracy is set at 3 mm as standard, corresponding to a measurement ac- curacy of 1 mm . Values greater than 1 mm are assessed as significant for analysis of horizontal migration. This applied both for positive (= lateral) and negative (= medial) migration as both migration directions were possible. For vertical migration analysis, only positive results (primal migration) of more than 1 mm were considered significant. The significance limit for wear of the polyethylene inserts was set as values greater than 0.5 mm . The results were displayed with the EBRAGRAF software of the Institute of Geometry of Innsbruck University, Austria . Statistical analysis was performed with the SPSS version 13.0 software (SPSS, Chicago, IL). Student's t-test was used to analyze the relationship between cup migration and the occurrence of implant associated osteolyses and other clinical, epidemiological and radiological parameters. Patients' consent was obtained from all patients prior to the start of this retrospective study according to our institutional regulations. Average follow-up after surgery for the study cohort was 2.6 ± 1.7 years (6 months-6.9 years). Five patients died during follow-up from causes unrelated with the surgery. Four patients (3.7%) had to undergo revision surgery: in one patient a loose cup had to be exchanged 1.8 years postoperatively, one patient had a superficial infection and underwent debridement 3 months postoperatively, one patient had recurrent joint dislocations and had an inlay and femoral head exchange 1.6 years postoperatively and another patient had polyethylene inlay wear out and received an inlay exchange. Analysis of the conventional radiographs revealed signs of focal osteolysis in 29 cases (27.1%). In six cases (5.6%), radiolucent lines were visible in DeLee and Charnley  zones one (three implants), two (two implants) and three (in one implant). Twentythree more patients (21.5%) developed radiographically visible bone cysts, predominantly in DeLee and Charnley zone two. 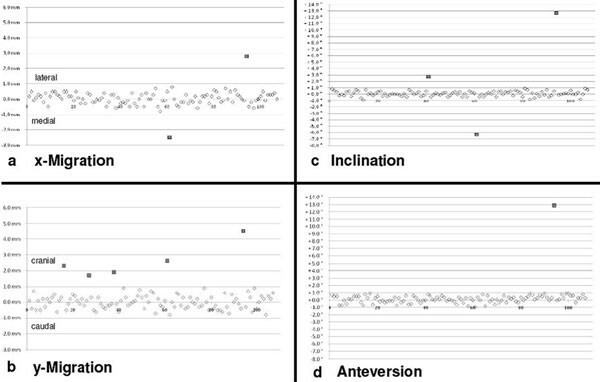 EBRA analysis could be conducted for all 107 implants, so that 428 (4 films per implant) data sets could be evaluated for cup migration in the horizontal plane (x-migration) and in the vertical plane (y-migration) as well as for the assessment of change in inclination and anteversion (Figure 3). Average migration in the study group was 0.2 ± 0.4 mm. One hundred and one cups (94.4%) showed no significant migration. A migration > 1 mm or a change in inclination or anteversion of more than 1.7° could be documented for six implants (5.6%). The values for these six implants are shown in Table 1. Example of EBRA analysis of an a.p. pelvic film with determination of cup and head position. The numbers indicate the order in which the tangent lines to the bony reference points were drawn. Examples of three different migration patterns: x-ray examples and underneath the year; in the corresponding SlMULGRAF diagrams, one square equals one squared millimetre. Each cup-symbol represents one measurement in a different a.p. pelvic film. a: migration diagram of a patient with 1.5 mm of cup migration cranially, beginning one year after implantation. Restabilisation was achieved in the further follow up of .36 months. b: migration diagram of a patient without significant migration of < 1 mm cranially or horizontally. Follow-up was 3.5 years. c: migration diagram of a an implant with aseptic cup loosening. Note the progressively migrating implant during 21 months of follow-up. The patient underwent revision surgery and replacement of the loosened implant. a: x-migration: horizontal migration of the study population. One box represents one implant. 105 implants (98.1%) show no significant horizontal migration in contrast to two implants (1.9%, black boxes for implants no 61 and 94) with significant horizontal migration. b: y-migration: vertical migration of the study population. One box represents one implant. 102 implants (95.3%) show no significant vertical migration in contrast to 5 implants (4.7%, black boxes for implants no 16, 27, 38, 61 and 94). c: inclination: cup inclination of the study population. One box represents one implant. 104 implants (97.2%) show no significant change of inclination (> 1.7°) in contrast to .3 implants (2.8%, black boxes for implants no 41, 94 and 61).d: anteversion: cup anteversion of the study population. One box represents one implant. 106 implants (99.1%) show no significant change of anteversion (> 1.7°0) in contrast to 1 implant (0.9%, black box for implant no 94). Migration pattern of the migrated cups. Of the six implants, three implants met the criteria of being loose, one cup was revised, the other two cups were not exchanged during the follow-up period. The other three implants restabilized spontaneously after a period of migration. Demographic, clinical and radiological data of both, the group with significant migration (n = 6) and the group without significant migration (n = 101) is shown in Table 2. There was no statistically significant difference within the group concerning factors that could predict a later occurrence of implant loosening. Comparison of the two groups of cups with migration > 1 mm and cups with migration < 1 mm. Note that there was no statistically significant difference between the groups. The use of additional screw fixation in a cementless, porous-coated hemispheric acetabular press fit component is contentious. Opponents argue that screws are not only unnecessary but can be deleterious, encouraging complications such as osteolysis and aseptic loosening . Recent data in large cohorts of patients show equivalent results following primary THA performed with and without screw fixation [6, 8–10, 12, 13, 27]. From the biomechanical point of view, especially those screws which are not in line with the weight bearing zone of the acetabulum such as screw fixation oft the ischium or pubis are not indicated . In this present study we used EBRA to investigate the migration pattern of 107 press fit cups in the presence of stabilizing screws. Six implants (5.6%) showed a significant migration pattern, three implants displayed early migration but were considered to have restabilized during follow-up. Of the three definitely loose cups, one was revised and exchanged for a new press fit cementless cup. The results of this series confirm previous reports of equivalent results of primary THA performed with porous-coated hemispheric acetabular components inserted with a 2 mm underreamed press-fit technique with and without screw-fixation [8–10, 12, 13, 27]. For cups implanted with screws, previous reports expressed concern about polyethylene wear debris and an increased risk of osteolysis due to migration of polyethylene into the pelvis through and along the screw tracts [2, 4, 11, 27]. This phenomenon was not observed in our cohort. However, the opportunity to use additive screw fixation may be indicated for selective cases. Screw fixation may be necessary whenever patients have soft bone due to osteoporosis, intraoperative fracture, a deficient acetabulum with inadequate rim coverage and inability to achieve a stable mechanical press-fit with underreaming of the acetabulum [2, 23]. Although acetabular components can be successfully stabilized and fixed with or without screw fixation, laboratory studies have demonstrated that press-fit cups without screw fixation show less micro motion than cups without screw fixation . In our study we could not reproduce this statement, partly because in vitro studies only evaluate a situation which corresponds to the immediate postoperative situation in vivo. Another factor which may influence the outcome of implant loosening and migration is the locking mechanism of the polyethylene liner and the type of polyethylene ranging from UHMWPE to different grades of cross-linked varieties. The advances in the quality of polyethylene available today have muted the concerns regarding the relationship of screw fixation, polyethylene wear, and osteolysis . The authors are aware that this study has some limitations such as a short follow-up period and a missing control group. Nevertheless we can conclude that additive screw fixation does not appear to be a major disadvantage in primary THA. At intermediate-term follow-up, cementless porous-coated press-fit acetabular fixation with screw fixation can be used successfully for primary THA.